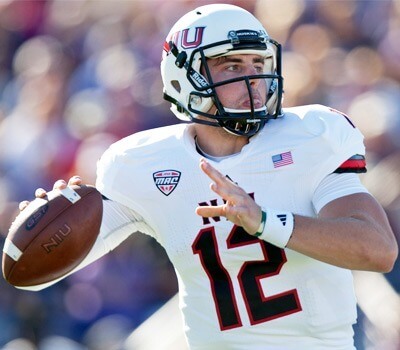 Drew Hare, who tossed two touchdowns and ran for a third last weekend in NIU’s 23-15 win over Northwestern, will start at quarterback Saturday in Las Vegas. 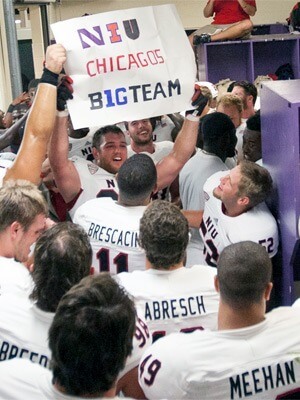 Hare, the third and final Huskie quarterback to take the field in Evanston, quickly earned Coach Rod Carey’s confidence. “That took all of about two seconds. We’re going to start Drew Hare and we’ll go with him. He’ll be the guy,” Carey said. Carey’s offensive line is ready to back up the new guy, who’s taking the reins from Matt McIntosh. “Drew is a good guy to be around. I would say he’s a little quieter during the week, but on game day, he kind of steps up his game and he’ll be a little bit louder,” offensive lineman Tyler Loos said. Last Saturday’s win – NIU’s third victory over a Big Ten team in the last two seasons and its nation-leading 16th consecutive success on the road in its opponents’ home stadiums – is already ancient history to the 2-0 team now focused on UNLV (1-1). The Sept. 13 game begins at 6 p.m. Central Time. Fans can listen to the action on AM 560 WIND from Chicago and WCPT 92.5 FM from DeKalb. 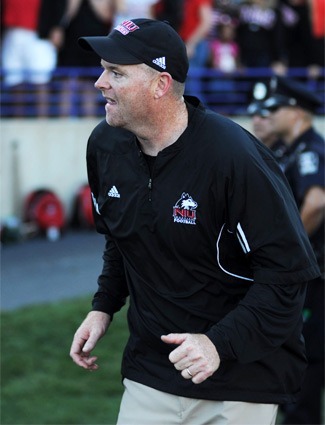 Although NIU has won all three games played against the Rebels – the last meeting on Oct. 5, 1995, found the Huskies atop a 62-14 final score – the coaches and players are preparing for a tough battle. UNLV is big on offense, runs around on defense and boasts “youthful” and “really explosive” wide receivers “certainly capable of going the distance at any moment,” Carey said. “Well, they’re built like a Mountain West team … you watch their matchups, they give you formations that really stretch you defensively in every way,” he said. Count Carey among those who were impressed. Forcing a quarterback off his spot and making him “move his feet and run around” when the offense is not designed that way are signs of playing good defense, he said. The boss also liked what he saw on offense, including Da’Ron Brown’s pair of touchdown catches. Akeem Daniels led all rushers – Huskie or Wildcat – with 83 yards. What about Saturday’s extra opponent, namely the desert?